Exquisitely crafted, this PANDORA Rose™ gift charm is wrapped with a stone-studded ribbon tied in a bow. 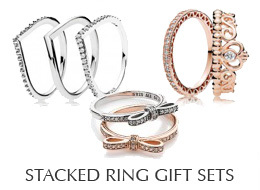 A wonderful gift for a loved one or a glamorous personal present for you. Ships Monday, April 22 if ordered in the next 2 days, 3 hours and 53 minutes! Sparkling Surprise Charm in PANDORA Rose™ & clear cubic zirconia.